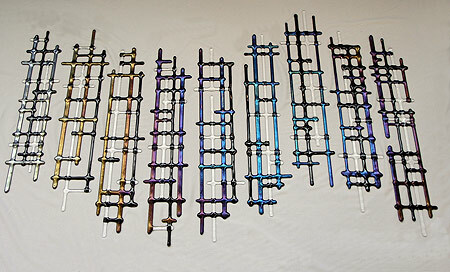 Cindy Brandt has now completed five fused glass wall installations for the World Bank Headquarters in Washington, DC. Her three newest pieces are located in concave alcoves and were specifically designed to transmit the bright colors of the glass onto the walls. Staggered Path shown here is just one of those alcoves. The other two use bright colored woven glass and can be seen here. 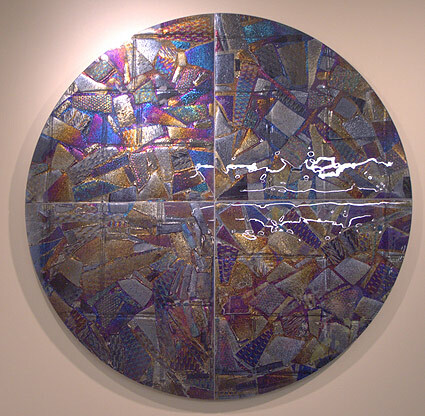 One of her previous two installations in the World Bank Headquarters building was the 42” circle of multiple layers of iridescent glass seen below. Actually composed of 4 quarter circles mounted together, it was meant to appear as a large black circle until the viewer approached and the texture and colors came alive. Site photos, close-ups and photos of the other installation, A Glass Garden can be seen here. 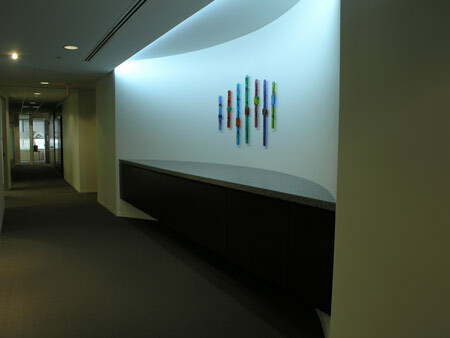 Another commission was an installation of multiple pieces for an office building in Chevy Chase, Maryland. These were designed for a convex wall where 16 of her woven glass hangings wrapped around the wall. Pictured here are some of the pieces laid out ready to be hung. Because these pieces wrapped around the wall, this is the only way to show the actual colors. These are typical of her iridescent unique “woven glass” work, which has been accepted into several shows and got her an invitation to have a small local museum show in 2010. Site photos and a short video of the installation can be seen here. A great deal of her glasswork is designed to be hung so that light creates patterns of color on the wall in addition to the color of the glass. Please visit her picasa gallery, her web page (currently being redesigned) and her torpedo factory artist glass web page to see more. To create commission pieces for distant sites she can work with a digital photo to show what her work might look like in the chosen site.